Hepatitis C: Medical Treatment or Herbs – Your have a choice! Asma is a 67-year-female from Indonesia. In 2005, she felt lethargic and had pains in the sternum (chest). She came to Penang and was diagnosed with chronic hepatitis C infection (HCV – subtype 1b). She was subsequently put on interferon therapy and at the same time, on Copegus, an oral medication. Asma received a total of 16 interferon injections. Each injection cost RM 800.00. 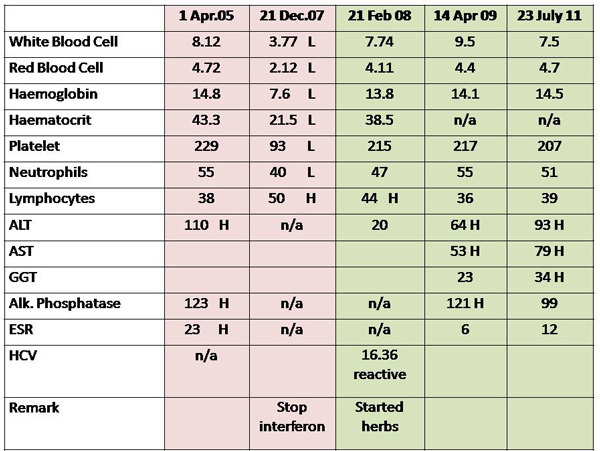 The following are the results of her blood test from 2005 to 2011. After the interferon therapy, Asma’s condition deteriorated. The levels of her haemotcrit, platelets and neutrophils decreased while the lymphocytes increased. With continued treatment, blood test on 21 December 2007, showed the levels of her white and red blood cells, haemoglobin, haemotocrit, platelet and neutrophils tumbled down further while the level of lymphocyte remained high – a greater deterioration of blood conditions. The doctor terminated the therapy after four months although the treatment was scheduled for six months. The doctor wrote: I have advised her to continue regular checkup with a view to resuming interferon therapy perhaps at a lower dose. Meanwhile she is only on Revicon. I suggest a repeat of her viral titre in three months’ time. (Note: Revicon Forte Tablet is a nutritional supplement that provides essential vitamins, minerals and amino acids to maintain general good health). Asma came to seek our help on 22 February 2008 but did not bring any medical reports. She was unable to explain what was wrong with her. We requested that she go back to her doctor and ask him to write her medical history and treatment. On 27 February 2008, Asma and two friends came to see us again. She was then started on herbs: Capsule A and B, Liver P and LL-tea. The following are excerpts of our video-taped conversation on 27 February 2008. Chris: Comparing the time before you had this treatment and the time when you were having the treatment (sixteen injections) – did you feel any difference about your health? Asma: Yes. After I received the injection I felt lemah (weak – lack of strength). C: So from your point of view, did the treatment bring you any benefit? C: It now appears that the virus is still there – not killed. Ibu (Mama), you need to take care of your diet. Avoid all forms of meat, oil, white sugar, dairy products and fine table salt. After this you can try some herbs that I am going to prescribe to you. There is NO medicine for me to kill the virus in you. But if the herbs can suppress the virus in you, that would be good enough. Female friend: Can she eat fish? C: Yes, but avoid the toxic type of fish. But remember again to avoid proteins from animals and eggs. These are not good for you. C: Ibu, three years ago (before the treatment), you said you were tired. Did you suffer from any other problem? A: I felt pulling pains on my chest. After the treatment, the pains were gone. Female friend: Now there are no more pains but the doctor said there is still virus in her. Male friend: Initially the doctor said the treatment would be for six months. After four months of treatment the doctor said she could not proceed with the treatment anymore. A: According to the doctor, if I continue with the treatment I can either die or become “lumpuh” (lack of strength and would be unable to walk). Male friend: If she continued with the treatment she might die or become lumpuh. C: Was that what the doctor said? Male friend: After the four months, the doctor was afraid to continue with the treatment. The blood was no good. C: Oh, now I understand. You come here because the doctor told you that he could not treat you anymore. When did he tell you that? Female friend: Last Thursday. The next day, Friday (22 February 2008), we came to see you. Male friend: The doctor said, “Just go home first”. A: The doctor said I am already old. Female friend: But four months ago, before the treatment, her age was not a factor. At that time the doctor said she was not old and she could undergo the treatment. On 30 August 2008, Asma came to see us again with her blood test results. All parameters were within normal limit. The numbers are a far cry from the time when she was under treatment. Chris: You came to see us on 22 February 2008 and now it is 30 August 2008 – essentially that is six months ago. Are you on the herbs all this while? Asma: No, in total I took for about three months only. This is because I could not find anyone to come and collect herbs for me. (Note: the patient is from Aceh, Indonesia). C: Tell us frankly, how do you feel now compared to those days before you were on the herbs? A: I feel much healthier now. Before I took your herbs I felt lethargic – no energy. My appetite was poor and I was not able to sleep well. I was also constipated. C: One interferon injection cost RM 800 and you have done a total of 16 injections. Were you getting any better than before you started with this treatment? A: I was not better at all. I felt tired. But the pulling pains at the chest had disappeared. C: Now after taking the herbs are you better? A: Yes, I am better. I am more energetic. I have good appetite and I sleep well. My bowels movements are good. C: You have just gone to see your doctor. What did he say? A: He wanted me to continue with my interferon therapy again in November 2008. No, I am not going to go for this treatment anymore. On 17 April 2009, Asma came to CA Care again. She was still doing well although she had not been taking herbs regularly. We reminded Asma that there is no such thing as a permanent cure for hepatitis. She has to take care of her diet and also continue to take the herbs. She should be responsible for her own well being. On 22 July 2011, Asma came back to see us again, after almost one and a half years of absence. Since the past three and a half years, she has been taking the herbs off and on. C: You took herbs since 2008 – more than three years ago. You came in February 2008 and it is now July 2011. Okay, how have you been doing? A: I am well. No problems. A: If I work too much, I felt tired, otherwise I am okay. My son just passed away and I felt tired. A:Yes, before the herbs it was not good. C: Before you said your appetite was not good? A: Now, it is good. C: Before you had pains in the chest? A: No more pains but if I am tired I will feel the pains. C: After coming here and starting to take the herbs, did you ever go back to your doctor? Took any medication from the doctor? A: No, never seen any doctor and I did not take any doctor’s medication. C: Tell me again, are you really healthy? You started to take the herbs three over years ago. A: I am healthy and better off today than when I was on doctor’s medication. I am a lot better now. C: What do you mean by better? A: I don’t feel lethargic anymore. And I feel healthy. C: Thank God for this. I did not expect such healing. You are indeed blessed. If you wish to continue taking the herbs, go ahead. Take care and know that this illness will not go away completely. Comments: According to Dr. Gabriel Ionescu, physician in the Division of Gastroenterology at St. Luke’s-Roosevelt Hospital Center in New York City, USA, the decision to start treatment for hepatitis C must be shared by doctor and patient. While this advice is most commendable, it is unfortunate that it did not happen in this case. Asma is a soft spoken and timid lady. Even to this day she is totally ignorant of what is going on or what is happening to her. She just accepted what was “dished” out to her without having the slightest clue of what the treatment is all about. Often we would say to patients: Patients educate yourselves! But this message has no meaning to such a person as Asma. Unknown to Asma, a diagnosis of HCV doesn’t necessarily mean she needs any treatment. According to the Mayo Clinic website: If you have only slight liver abnormalities, your doctor may decide against medical treatment because your long-term risk of developing a serious disease is slight, and the side effects of treatment can be severe. (http://www.mayoclinic.com/health/hepatitis-c/DS00097/DSECTION=treatments-and-drugs). Even if when treatment is deemed necessary, patients may not know that the treatment helps some, but cure remains elusive. Once HCV is contracted, treatment or the body’s defenses can cure a small portion of patients. In most others, however, HCV’s frequent mutations allow it to evade the immune system, defeating attempts to develop a cure. Some treatments are available, but they don’t work for all patients. (FDA Consumer, http://www.fda.gov/fdac/features/1999/299_hepc.html). Let me quote the Australian Prescriber, Not everyone infected with the virus requires drug treatment. Hepatitis C itself is often not going to cause severe liver disease. It is the combination of the viral infection plus factors such as alcohol excess, obesity, diabetes … that leads to more severe liver disease. Addressing the secondary factors will lead to significant changes in liver function (http://www.australianprescriber.com/magazine/29/2/36/9/). From this statement it appears that a change of lifestyle and diet is even more important than the treatment itself. But in this case, Asma was given the treatment but the doctor did NOT tell her to address the “secondary factors” that are so important for her protection. In this case, there is no doubt at all that the interferon treatment made her worse. Her blood parameters deteriorated; compelling her doctor to stop the treatment, otherwise she might just die or become “lumpuh”. She was told, After all you are already old. But the irony is that, according to the doctor’s letter, when Asma’s blood had improved or returned to normal, the doctor wanted to resume the interferon therapy again. And this time at a lower dosage – is this REALLY necessary or wise? Why use a drug that did not work anyway? Based on the natural history of the virus, only 5% to 20% of infected patients would go on to develop liver cirrhosis over a period of 20 to 30 years. And 1% to 5% of them would develop liver cancer and die. Noting that Asma was already 64 years old then, could it be that she would develop liver cirrhosis when she is 84 or 94 years old? Even with cirrhosis she would not die yet. Even more so if she takes care of her diet. But the doctor did not tell her about the need to take care of her diet! This story was left unfinished for many months. It was only when Asma came in again in July 2011 when we thought there is a good reason to finish it and publish! Now, let us get to the crux of the case. Asma was on medical treatments for her hepatitis for three years. She spent a good amount of money for that treatment. What then was the result? She ended worse off than before receiving the interferon injections. The doctor prematurely terminated her treating saying that she just might die or become paralysed from it. It was only then that Asma came to us for help. She was on the herbs. It has been more than three years and Asma is still healthy. Asma said she is better off today than when she was on medical treatment. If herbs are harmful, what could have happened to Asma after her medical treatment was abandoned? Given at that time, the blood parameters were “bad.” If the herbs were harmful, the numbers would have become worse! But she got better instead. They say medical treatments – the Interferon or the Copegus are FDA-approved, scientifically proven. Proven to do harm or proven to cure in this case? One amusing advice which I gathered from the internet is this (see notes below). We are told that patients can help keep the hepatitis from getting worse by not taking any herbal supplements unless the doctor tells it is okay. What do you think of such advice? What do doctors know about herbs? Can doctors give a knowledgeable and unbiased opinion about herbs? Hepatitis is a Latin word for inflamed liver. In this case, the inflammation is due to virus. Currently five viruses, A, B, C, D and E have been identified to have the ability to attack and damage the liver. Of these five, Hepatitis C virus (HVC) is viewed as the most serious. It can cause irreversible scarring or cirrhosis of the liver which later can lead to liver cancer or liver failure. Hepatitis C infection is often referred to as a “silent epidemic” and is a worldwide problem. Millions of people are infected with this virus for years. The virus may just lie dormant and many people may not experience any symptom – no symptoms of liver damage and the liver enzymes are at normal levels. In other cases, HCV can be detected in their blood and the liver enzymes are elevated. It is said that of every 100 people infected with the hepatitis C virus about 75 to 85 people will develop chronic HCV infection. Of those with chronic HCV, 60 to70 people will go on to develop chronic liver disease, 5 to20 people will go on to develop cirrhosis over a period of 20 to 30 years and 1 to 5 people will die from cirrhosis or liver cancer. dark yellow urine or light-colored stools. A diagnosis with HCV does not mean that you must receive treatment. This is not necessarily the best option because the drugs used to treat HCV have serious side effects, are expensive and do not work for everyone. That being the case you need to “wait and see” and monitor your liver function enzymes to know how well your liver is working. Studies have shown that current drugs are effective in up to 50% of patients with genotype 1 and up to 80% of people with genotype 2 or 3. Pegylated interferon alfa-2b (Peg-Intron) or pegylated interferon alfa-2a. In Malaysia pegylated interferon alfa-2a is sold as Pegasys (by Roche) and comes in a pre-filled syringe with fine gauge needle. Patients can bring the syringe home and inject the drug him/herself once a week. Ribavirin. This oral drug is available in Malaysia as Copegus (by Roche) and comes as a 200 mg tablet. Patients generally take 3 tablets, twice a day. Taking Copegus alone without Pegasys is not effective for the treatment of chronic HCV infection. The length of treatment depends on the type of the hepatitis C virus or genotype. For genotype 1 generally the treatment lasts for one year, while genotypes 2 and 3 are treated for six months. If the drug is ineffective after three months, the treatment is usually discontinued. Patients are advised to avoid this treatment if they drink alcohol, have advanced cirrhosis or liver damage, have severe depression or other mental health problems, are pregnant or might become pregnant, have autoimmune diseases such as lupus, rheumatoid arthritis, psoriasis, and advanced diabetes, heart diseases or seizures. Stopping the use of alcohol. Not taking any herbal supplements unless the doctor tells it is okay. Interferon can cause severe flu-like symptoms (chills and body ache), irritability, depression, concentration and memory problems, skin irritation, decreased thyroid function, constant fatigue, headaches, fevers, nausea, and insomnia. Ribavirin can cause a low red blood cell count (anemia), itchiness, nasal congestion, skin irritation, and fatigue. Ribavirin accumulates in the testicles and ovaries and causes birth defects. Combined therapy of pegylated interferon and ribavirin may cause suicidal behaviour in some patients. Patients may also suffer from nausea, cough, shortness of breath, rash, itching, insomnia, and loss of appetite.